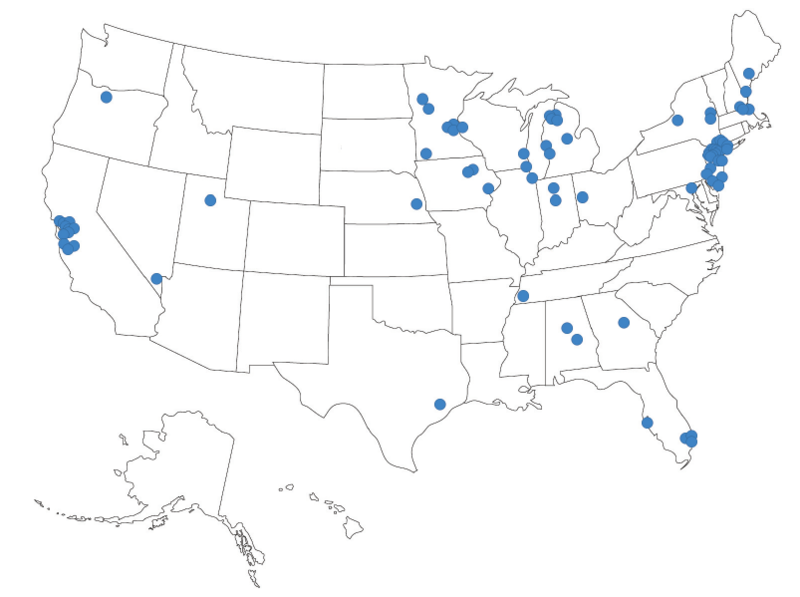 More than 80 communities, states, counties and planning agencies adopted complete streets policies in 2013, according to Smart Growth America. 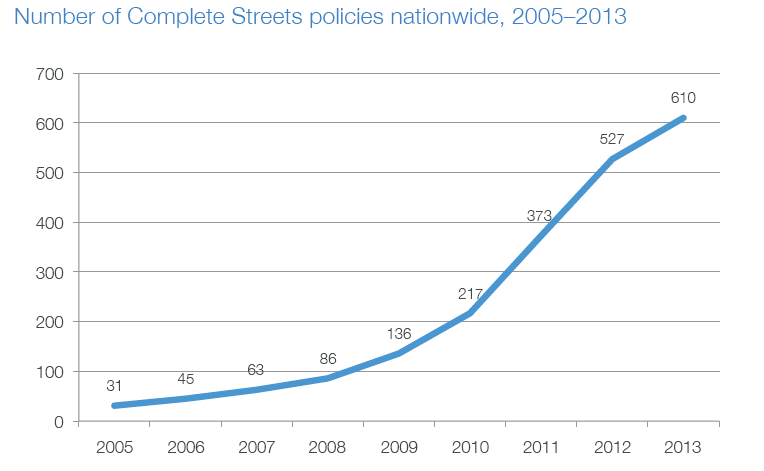 A growing number places are adopting policies to create safe space on the streets no matter how you get around. This year 80 new complete streets policies were passed by municipalities, states, counties, and planning agencies around the United States looking to make walking and biking safer. That brings the total number of such policies in the nation to more than 600. Complete streets policies are also getting better compared to earlier iterations, according to a new report from Smart Growth America and the National Complete Streets Coalition. The way current policies are being written and enacted is much more likely to ensure strong results. So what makes a complete streets policy great? SGA ranked the best policies enacted in 2013 according to 10 criteria, including “vision” and the strength of performance metrics, among other factors. It’s important to have an implementation plan with teeth, or else a complete streets policy won’t make much of a difference. Karen Mendrala, a livability planner for Fort Lauderdale, said her city compared every existing street to its standards for complete streets. The idea is to systematically identify all the gaps in the city’s walking and biking networks — and fix them. Fort Lauderdale also developed a design manual, another key element recognized by SGA, which stresses the importance of recognizing modern design guidelines for multi-modal streets (NACTO’s street designs guide comes to mind; AASHTO’s Green Book does not). Piqua scored points for passing a policy that all street interventions — not just road reconstruction or resurfacing — bring the project area into compliance with complete streets standards. Complete streets policies that only apply to new construction or are ambiguous about what projects they apply to get docked in SGA’s rating system. SGA says the best policies also establish standards and procedures for granting exemptions. The Massachusetts Department of Transportation scored points for its handling of this issue. If a project in Massachusetts doesn’t meet the state’s complete streets standards, it can’t continue without approval from the secretary of the DOT, the state’s top transportation official. Love the SGA rating system. The graph looks like some type of S curve where policy implementation may be flattening out. Have we reached peak complete streets? The NACTO guide has some great pictures. Which Places Have the Best Complete Streets Policies?